Kansas City-Style Brisket Burnt Ends : Holy crap, these were nuggets of goodness! Nicely charred, juicy inside. Texas Beef Sausage: Tightly grained and very flavorful. Firm, yet tender. It's a really good sausage. My only regret is that we only ordered one and had to share. They're not huge sausages, so order extras. Pulled Pork: Good. Tender. A little bland, almost like chicken. Sliced Brisket: Sliced thick, the way I like it. Darn good. 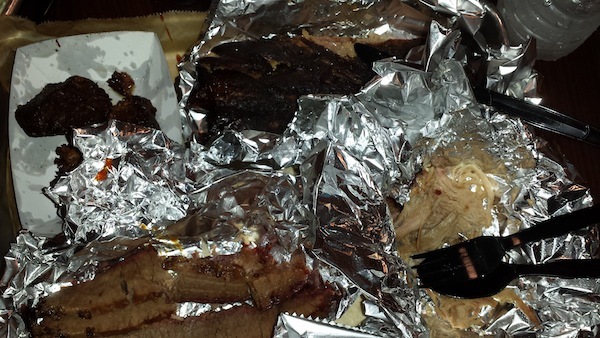 My only problem here was that I ordered too much food and most of the brisket got cold before I could eat it. Cold brisket just isn't very good. BBQ Chicken: Meh. It's BBQ chicken. Chicken is really just a default for those who don't want pork or beef. I'll note that Sweet Fire Donna's provides four BBQ sauces. There's a traditional sweet one, which was fine. There's a chipotle one that wasn't very hot at all, but did pack in a nice flavor profile. The mustard-based one was weird. It was more of a flavored mustard than a Carolina Gold sort of sauce. Tasty, but not what I was expecting. Worked great with the sausage, but was simply too much for the pulled pork. Then there was a very nice North Carolina vinegar sauce, puckery but not too puckery. This worked wonderfully on the pulled pork. Its only flaw was that the pepper flakes sometimes jammed the hole in the squeeze bottle. Sweet BBQ Baked Beans: While the name says sweet, these are not the all too typical gloppy sweet mess that you often get other places. There's a good spicy edge and the sweetness doesn't overwhelm. They're very good. Corn Bread: It's not corn bread; it's corn cake. Still, it's damned good corn cake. They do include whole kernels in it, which I dislike, but they form a layer at the bottom and are easily avoided. Bourbon Pepper Jack Creamed Corn: Despite the fancy name, this is more like Velveeta Corn with some peppers added. I scoffed at my first spoonful, but before I knew it, I had finished it all. Cool Cucumber Salad: Your standard cuke salad with red onion. Tasty. Good palette cleanser. Skin-on Potato Salad: Good, but I thought the huge chunks of potato overwhelmed the dressing. Just tasted like cold potatoes. Fiery Mac & Cheese: I wanted to love this, but it just tasted a little weird. I can't put my finger on it. Creamy Cole Slaw: Oh, the disappointment. Tasted like macaroni salad, without the macaroni. Overly thin dressing with overly large pieces of cabbage. Despite some disappointments, this was very good BBQ, especially when it came to beef. If I lived nearby, this would be a place I would visit far too often. Oh, here's a photo. Trust me, this photo doesn't do the food justice. Also note that the Burnt Ends were nearly gone by the time I remembered to take a photo.